The restaurant designed by Rockwell Group with exclusive art installations from Murray Moss, makes for a relaxed fine dining atmosphere in the Nolita area of New York; it was what I expected from the F&W group, a sleek and refined space with a charming feel. I went with some old friends I met in Spain a while back who had just moved to NYC and we ordered a plethora of dishes; for entrée we ordered the seared Hudson Valley foie gras, potato gnocchi, Maine diver scallops and the Steelhead salmon crudo while for the mains we ordered the crispy sasso chicken and the 44 Farms prime beef (a bone in sirloin). 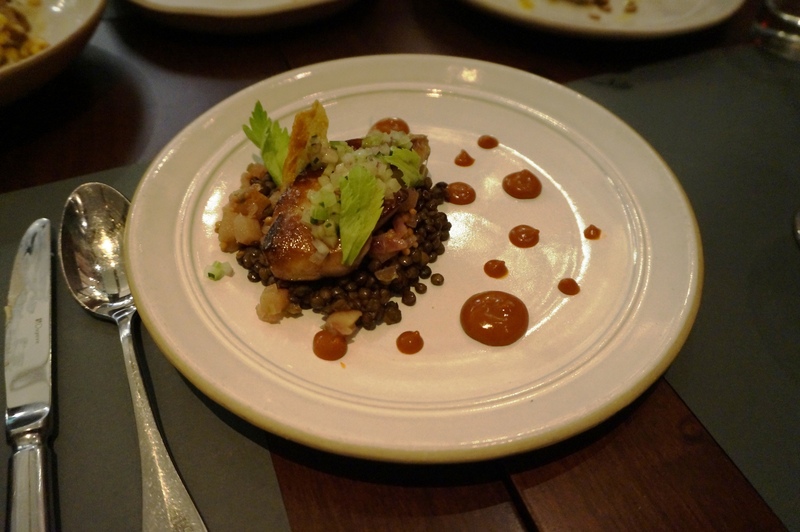 The entrees came out first, the foie was a nice sized slab with seemingly unusual fixing, lentils, hot sauce, chicken skin and a pear chutney, nevertheless an amazing dish, the lentils and chicken skin with the hot sauce and sweet pickled pear was a dynamite combination. Completely unusual but a wunderkind type of experimental dish, just enough of the usual fixings to work with the “out there” lentils and hot sauce. 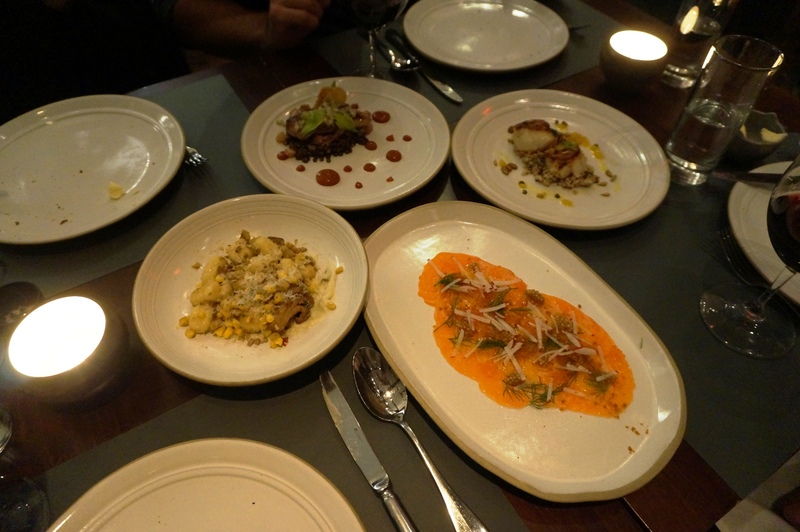 The salmon crudo was fresh, light and flavourful and everything you could want from it. 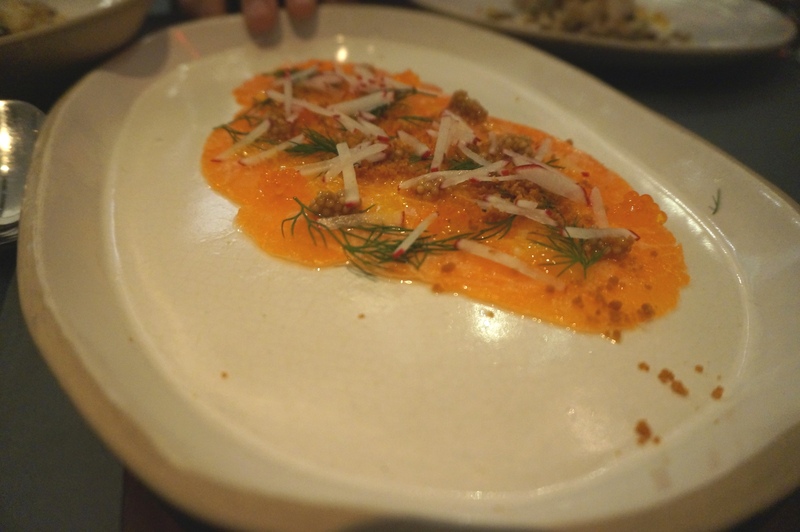 The radish crunch complemented the soft fish with the brown butter and egg yolk creating a creamy, tasty texture. 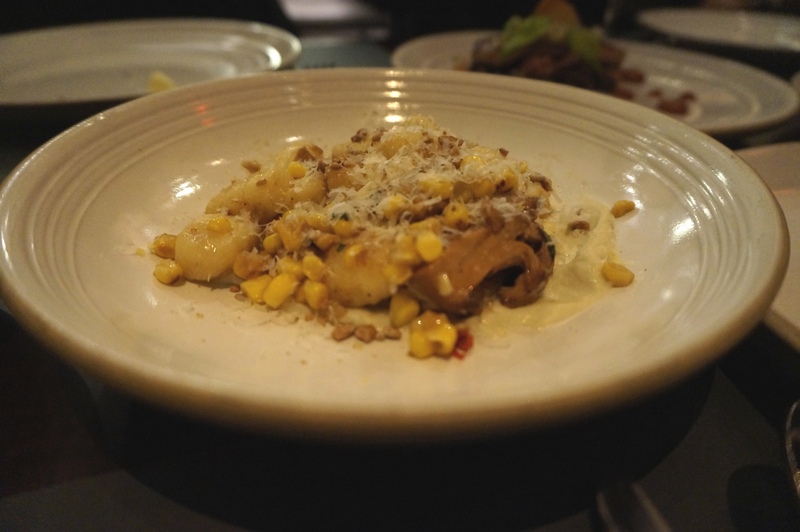 The gnocchi was a great mix of creamy potato and plump chanterelle as well as a charred corn all topped with fennel and chili, a wholesome and thoroughly satisfying dish with a vibrant array of flavours. 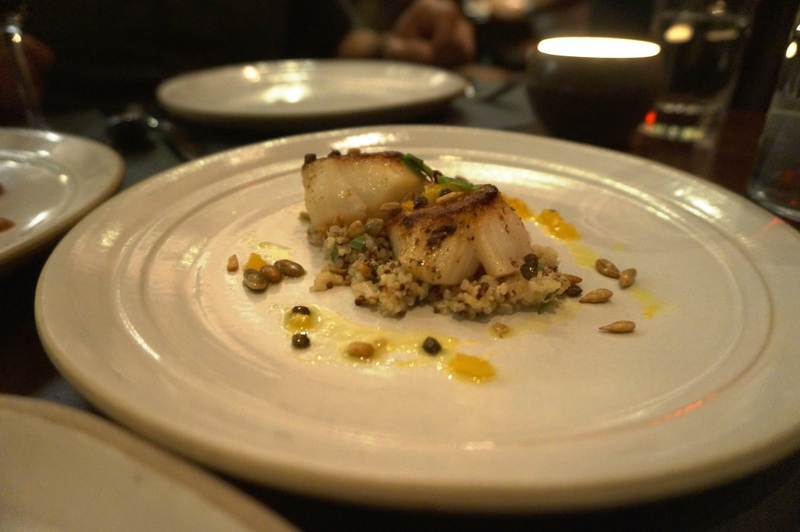 Lastly the scallops were picturesque, a lovely brown crust and a white centre cooked perfectly atop a base of quinoa, lemon and a touch of chili oil; the dish was my favourite of the entrees, and knowing how much I love foie gras that should tell you something! The mains came out and I started with the chicken, a large deboned leg that was extremely slow cooked on one side and super crisp on the skin side, served with spoon bread and a chicken jus that was divine, the dish was incredibly well-balanced and the cooking was exceptional, a juicy chicken while still leaving a crisp skin. 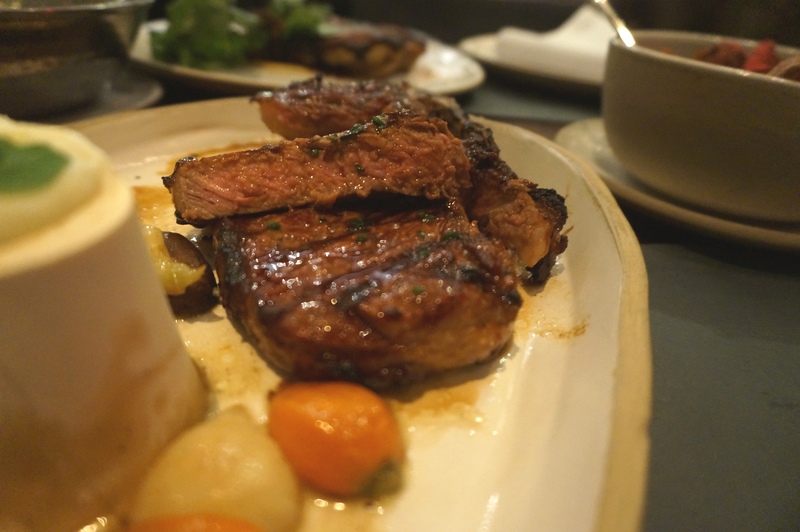 Finally,the steak; it was cooked a tad too much and it gave the cut a slightly grainy texture but other than that it was a great piece of meat with a fantastic onion glaze that married perfectly with the bone marrow. Served with autumn vegetables that were roasted to perfection it was my favourite of the mains. 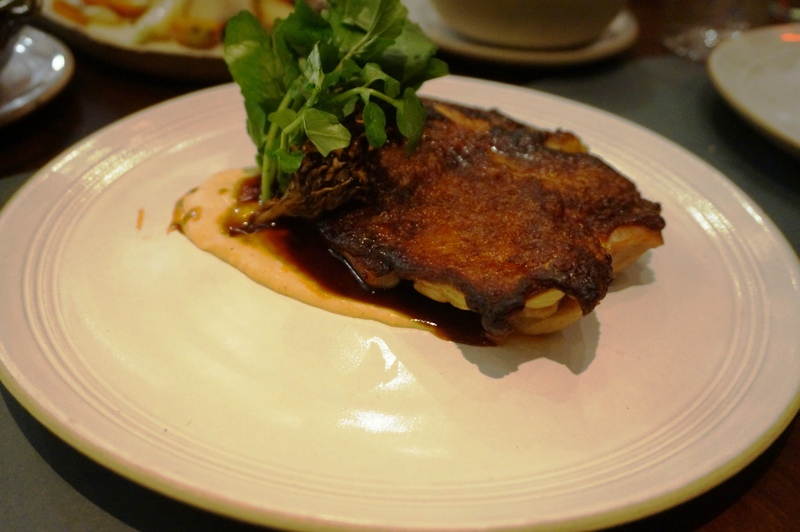 Chefs Club was a great dining experience; the atmosphere, was fantastic and the food was sublime, somewhere I would definitely head to again. 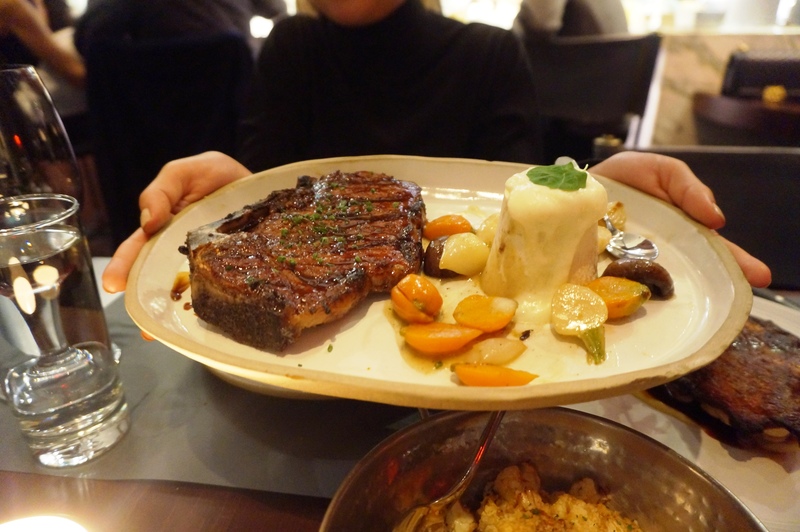 Posted on November 5, 2015 November 5, 2015 by AdrielPosted in New York, Steak, United StatesTagged chefs club, Chicken, foie gras, gnocchi., NYC, scallops, Sirloin, steak.